I recently learned about a series of books designed to introduce young children to sign language. The story behind the books is so inspiring and the books themselves are perfect for teaching little ones basic words in sign language that they can use in their everyday conversations. Don McNamara was a grandfather looking for a way to communicate with his two granddaughters- 3-year-old Abby who was diagnosed with cerebral palsy and 7-year-old Alyssa who has global developmental delays. While both girls can hear, Don was looking for a way to help both girls communicate with himself and others in a much richer way. To learn more about Don and the inspiring story behind his decision to write these books, click here. Don, known by most as Grandpa Don, has written 6 sign language books each with a different theme. In each book Abby and Alyssa describe and demonstrate each sign so that readers can learn to sign with them. The text and illustrations in the books are simple allowing young children to pick up the books on their own and learn the signs without any help from others. The themes help you connect the books and the signs into many units of your study. You can learn more about Abby and Alyssa on their site Fun with Abby and Alyssa, on Facebook, and from PlayAbility Toys. 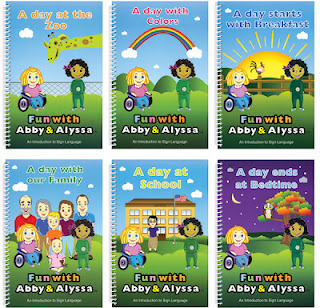 I am so excited because Grandpa Don has graciously agreed to give away a set of 6 Abby and Alyssa books to one lucky follower. All you have to do to enter is follow Chalk Talk, check out the site Fun with Abby and Alyssa, and like Abby and Alyssa on Facebook. Leave a comment or comments below letting me know what you did. Don't forget to leave your email address. The giveaway ends at midnight on Friday July 6th. Good luck! This is great! I have follow your blog, I have liked their Facebook, and I have shared this on my Facebook. I follow Chalk Talk:-) Thanks for the chance to win! I checked out Fun with Abby and Alyssa website. They also offer a free download of posters with the alphabet in sign language. Great resource...our kindergarteners learn the letters in sign on Starfall as we introduce each letter. The posters would support that. I also like Fun with Abby and Alyssa on FB. Thanks again! I follow Chalk Talk, visited their web page, and liked them on Facebook. I've been thinking about ways to incorporate sign language into the classroom, and this looks great! I follow you and am crossing my fingers to win. :) Their site looks great. I love using sign language in school. I also follow (and love your blog). I follow you, checked out the site, and liked them on Facebook! I Liked Abby and Alyssa on Facebook. What a treasure to have. I follow your block, checked out Abby and Alyssa's website and their facebook page. I would love to have a set for my classroom. My daughter has a hearing loss and we are about to introduce sign language to her and these books look GREAT! I would also like them for my classroom. I already follow your blog. I also checked out the Abby and Alyssa website and liked them on facebook. I use sign language in my classroom on a daily basis. These books would be a great resource to add to my collection. Keeping my fingers crossed. Just visited Fun with Abby and Alyssa. Loved the personal touch with the video as an introduction. I was also excited to see the free downloads. What a great resource for the classroom with or without the books. Thanks for sharing. I follow your blog, checked out Abby and Alyssa & liked them on Facebook. I use ASL in my classroom and these books would be another great addition to the classroom! I love these books! I already teach my kids some sign language, this would be such a helpful addition! The story is so great! I just visited http://www.funwithabbyandalyssa.com/about.html and clicked like cia facebook. I am inspired by this man who was willing to learn and write books based on swign language. I work with students with special needs for five years now. This past school year was my official year as a "teacher" even though I feel like I was always a teacher in the kids eyes. I already follow your blog =) And I "liked" Abby and Alyssa on Facebook. Thank you for this giveaway!! I am so excited to find these books! I am a big believer in using Sign Language in the classroom. It helps students develop vocabulary (especially second language learners), discover links between words (like class, group, team and family) and learn about different ways people communicate. We love Signing Time in my classroom already and look forward to learning more sign language with Abby and Alyssa. These are so great! I love your blog and have been reading all school year! I'm following you on pinterest now! I also visited the Abby and Alyssa site and liked them on FB. I already use a little sign in my classroom. It's such a fantastic way to enrich your classroom. The little ones really respond to it! Thank you so much for introducing me to Abby and Alyssa and their Grandfather. I am a brand new teacher and I know that I can use these resources to introduce my classroom to ASL. I'm excited to provide such a rich experience for my students. I have been looking a your blog for a while now, don't know why I have not "followed it", but I have now! Thanks for sharing about the books. I will be recommending them to my teaching staff! I have also added them to my friends on fb! Love all you are doing, thanks for sharing and for loving children! I have been looking for a kid friendly way to introduce sign language to my kinders. This look great! Thanks for sharing! I teach at an elementary charter school in Harlem and we use LOTS of sign language for our ELLs. By the end of Kindergarten/First Grade, many of our kids can sign for "water, bathroom, friend, help, walk, quickly, slowly, two lines, eat, drink" and the alphabet. This book series would be SUPER helpful for our early kindergartners to build their sign language vocabulary. I have been wanting a way to introduce sign language in my EDK classroom, and this could be the perfect springboard! I am already a Chalktalk follower, I enjoyed the website, and liked them on FB. Thank you for sharing! I followed your blog, liked their Facebook page, and visited their website. I'm a preschool speech pathologist and would LOVE a copy of these books!! Oops forgot to leave my e-mail address! Love the book resource. What a neat story too. I use a little ASL in my classroom and the kinders really respond to it. They'd love a book resource. Not to mention my son. I'm a follower, a liked their page on facebook & I visted the website (where I wished I could see inside the books :).